Currently viewing the tag: "Lucifer Rising"
"It seems I'm not quite over my hankering for cheese. 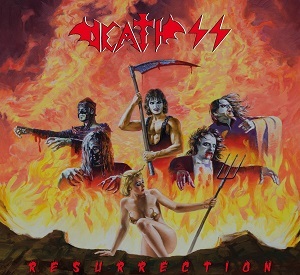 In simple terms, that means you get to sit through a review of Resurrection, the aptly titled rebirth of Italian band Death SS and their brand of 'horror music'. Death SS have quite a history, going back to their inception in 1977 with the only constant of the band (outside of the Evil Metal EP) being the odd vocal styling’s of Steve Sylvester. The list of former members is pretty astonishing (upwards of 30 member changes) which probably accounts for why Death SS have done a complete about-turn when comparing Resurrection against its predecessors." First Powerwolf and now this? Madam X is off the reservation and wandering through Cheese Land and she may never be the same. Ever see KISS Meets the Phantom of the Park? This could be KISS Meets the Madam.